Save The Date - Pasifika Medical Association Conference 2019! More information coming soon! no later than Friday 7th June 2019. Workshop Two will once again provide opportunity for attendees to discuss research partnerships and projects with counterparts and interested stakeholders. In addition, it will build upon the work of mapping research needs started in Workshop One with more focused discussions on the five major research themes. Workshop Two will also aim to generate concept notes, research groups, and outline agreements toward funding proposals and collaborative actions. In response to feedback from Workshop One, the second event will be longer and aims to more closely involve policy makers, multilaterals and donors in discussion. We look forward to facilitating exciting collaborations between researchers and practitioners who are focused on addressing the health challenges in the region. As we did at the first workshop, we are using a non-conventional workshop format, designed to allow our attendees to engage with each other to explore issues in depth, and to develop new and exciting partnerships. Presenters and facilitators are both Pacific and international researchers and practitioners, and breakout sessions use a modified talanoa method to facilitate hearing from all our attendees to learn from their knowledge and experience. We hope you enjoy your time with us here in Nadi and that your time here will help in the establishment of new initiatives and working relationships. Please see file below for more details! Rekindle the fire. Learn the science and practice of compassionate care. On March 16th 2019, UOA will convene the first ever compassion in healthcare conference to be held in New Zealand. We are bringing together experts in compassionate care, from scientists to clinicians, to inspire, teach and share the practices of compassion in day to day clinical care. Kia orana, Talofa lava, Malo e lelei, Taloha ni, Fakalofa lahi atu, Ni sa bula vinaka, Ia orana and Greetings! The iconic Pasifika Medical Association Conference will be held at the Holiday Inn Auckland Airport Hotel, New Zealand on the 14 – 15 November 2018. It is with great pleasure that we invite you to join us for the largest annual meeting of Pacific health workers and professionals from around the region. Our Conference continues to provide the opportunity for delegates to collaborate on a range of issues important to improving the health outcomes of Pacific peoples across the region. It enables us to reach beyond our geographical boundaries, move out from our everyday concerns and share with our colleagues innovations, learnings, best practice and supports us to develop solutions to the challenges that face all our countries. Nā tō rourou, nā taku rourou ka ora ai te iwi With your food basket and my food basket the people will thrive. The food we and our families eat is important for our health and wellbeing. ‘Good food’, delivered by a great ‘food system’, is vital to the health of all New Zealanders. Much has been done by communities in South Auckland, public health workers, and researchers at AUT, to promote good food at low cost. This one-day symposium brings together community, researchers, students, government, and business to share successful projects and related research on good food. Catering will be provided please click here to register now for this free event! The Pacific Health Governance Research Network (PHGRN) is proud to announce its second Workshop. Workshop Two will be hosted by Fiji National University (FNU), the Pacific Community (SPC) and the University of Queensland, at the Tanoa International Hotel in Nadi, Fiji. The PHGRN is building a network to create spaces for research partnerships between Pacific researchers and stakeholders, and Australian and international counterparts. The network focuses on health governance in relation to the SDG agenda, seeking to help the region meet goals and targets, and ensure that no-one is left behind. Research and actions under the PHGRN will be consistently informed by Pacific voices, to ensure integration of local knowledge into research and that research addresses practical local needs leading to positive chance in the Pacific. The PHGRN is organised into five major research themes which are designed to capture the diverse and overlapping challenges and opportunities for health and policy in the Pacific region and the broader context of the Sustainable Development Goals agenda. Workshop Two will provide opportunity for attendees to discuss research partnerships and projects with counterparts and interested stakeholders. In addition, it will build upon the work of mapping research needs started in Workshop One with more focused discussions on the five major research themes. Workshop Two will also aim to generate concept notes, research groups, and outline agreements toward funding proposals and collaborative actions. In response to feedback from Workshop One, Workshop Two will be longer and also more closely involve policy makers, multilaterals and donors in discussion. Workshop Two will involve both plenary sessions, and parallel breakout sessions focusing on specific issues under each of the five major research themes. We aim to make Pacific voices central in directing the PHGRN research agenda. Parallel breakout sessions will each be co-facilitated by a Pacific Islander and other international researchers and practitioners and will use a modified Talanoa method to facilitate broader engagement of attendees. Finally, attendees may benefit from one of three training sessions provided by experts in the area of media communications, grant writing, and policy brief preparation. See program overview and five themes below! • 80 AUD for international attendees. Please note: Limited travel scholarship places will be available for Pacific researchers and practitioners. The scholarship application form can be found here and should be submitted to pacifichealthgovernance@gmail.com by the 15th September 2018. The New Zealand Institute for Pacific Research (NZIPR) promotes and supports excellence in Pacific Research. We are bringing together thought leaders from New Zealand and the Pacific region to an inaugural conference at the Fale Pasifika Complex on 29-30 November, 2018. The conference aims to showcase Pacific research from throughout the region, enhance Pacific research networks, and encourage new conversations around contemporary Pacific research modalities. Pacific ethics of research and care: expanding relationships, procedures, and processes. The call for sessions are now open and we invite researchers of all persuasions, policy makers at all levels, and development consultants in all their diversities to submit session abstracts. NZIPR researchers are encouraged to submit session abstracts to highlight their research and to create linkages to other research occurring on similar topics. Session abstracts should be 200 words in length. MedSci is New Zealand’s premier multi-disciplinary biomedical and medical sciences conference and incorporates the meetings of the NZ Society of Endocrinology and the Physiological Society of NZ, as well as special interest groups from the Auckland Bioengineering Institute, the Institute of Biomedical Technologies and the Otago Centre for Neuroendocrinology. See MedSci 2018 programme at a glance and other details. Organising committee is headed by Drs Joanne Davidson and Marie Ward from Auckland University. Registrations for New Zealand’s largest annual bioscience conference are open at www.queenstownresearchweek.org. The meeting will be at the newly renovated Rydges Hotel in Queenstown and we expect up to 1500 registrations for these meetings. The opening plenary lecture will be delivered by Nobel Laureate Prof Elizabeth Blackburn. As usual the Australasian Winter Conference for Brain Research and ASCEPT NZ meetings will be part of the week. It will also continue to incorporate the 2018 QMB and 2018 Medsci meetings and the week will also feature a record 8 satellite meetings on Marine Biology, Plant Biology, Rare Brain Diseases, Bioinformatics, Gene Technologies, Cancer, Drugs and Medical Devices and Immunology (in association with ASINZ). The NZ Society for Oncology (NZSO) will also be having their annual meeting in Queenstown to link with Queenstown Research Week. A week of science not to be missed. 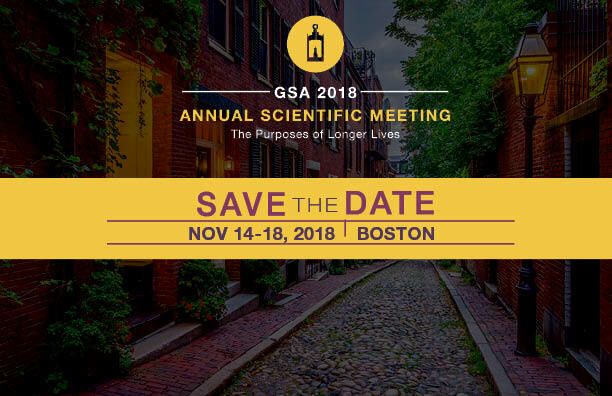 GSA’s 2018 Annual Scientific Meeting will take place November 14-18, 2018 at the John B. Hynes Veterans Memorial Convention Center in Boston, Massachusetts and will focus on the theme, "The Purposes of Longer Lives" chosen by incoming GSA 2018 President, Dr. David Ekerdt, University of Kansas. Below is a video of Dr. David Ekerdt sharing what the theme means to him. The 19th South Pacific Nurses Forum will be held from 15th-19th October 2018 in the Cook Islands and will bring together evidence, experience and innovations highlighting nursing contribution to Universal Health Coverage and demonstrating how nurses are important to ensuring access and quality of health care for all. The theme of this year's meeting: "Transforming Leadership - Nurses as Change Agents for Non Communicable Diseases (NCDs) in the Pacific" encourages nurses to take the lead and lead by example to be full partners with other health professionals in redesigning and advancing health care to address the challenge of NCDs. NCDs are the greatest challenge to Pacific people in this 21st century. Nurses need to lead the way in the prevention and management of these conditions to improve the health and reduce the mortality and morbidity of Pacific people. Submission of abstracts are now open, and the deadline for submission of abstracts is 23rd April 2018. To register click here. Looking forward to travelling to #stunning Suva, #Fiji for the Fiji Nursing Association #Nurses Symposium, April 26-28, 2018, and presenting the results of our latest research project with #Pacific family carers. The symposium theme is Nurses: A Voice to Lead - Health is a Human Right. Around 80 scientists, health specialists, health policy makers and funders along with frontline community health workers and community members joined together at Iritekura Marae in Waipiro Bay early April to discuss better solutions for metabolic disease (type-2 diabetes, heart and kidney disease and gout). The meeting was part of the annual Queenstown Research Week, and thanks to The Maurice Wilkins Centre and Ngati Porou Hauora, was the first to venture out and bring academic discussion to a remote rural community, said organisers. HRC chief executive Professor Kath McPherson, who took part in the event, came back energised by the level of interest and engagement among the community. “There was a palpable sense of wanting to see quality research that delivers meaningful results, and to see researchers connect more with small communities, to identify the questions that matter and how best to translate research into change," she said. “This meeting didn’t just happen - it was a lot of work by Ngati Porou Hauora, the country’s smallest PHO – and The Maurice Wilkins Centre, one of the country’s dedicated Centres of Research Excellence. Pictured: Deputy Chair of Ngati Porou Hauora, Huti Puketapu-Watson, Kai Karanga, leading the manuhiri onto Iritekura Marae. We Are The Pacific Ocean are delighted to support and announce the Tatai Oranga: Joining forces to tackle metabolic diseases 2018 Symposium. It will combine the expertise of the community, clinicians, and scientists to tackle the epidemic of metabolic diseases type-2 diabetes, kidney and heart disease, and gout, with a particular focus on the impact of these diseases on Māori and Pacific communities. The Symposium will be held over three days from the 4th to 6th April 2018 on the East Coast in conjunction with the Ngāti Porou Hauora Charitable Trust to acknowledge their recent establishment of a joint research centre with the Maurice Wilkins Centre. The first two days of the Symposium will be held at Iritekura Marae in Waipiro Bay, and then in Gisborne at the Gisborne Hospital Learning Centre for the third day. Day 1 will focus initially on big picture issues we need to tackle together to stem the wave of metabolic diseases. The aim will be for a consensus to emerge from the focused discussion between local community members, clinicians and scientists on approaches to moving forward together to improve our wellbeing by reducing the prevalence and impact of metabolic diseases. Day 2 will focus on scientific presentations on subjects that include genetics, biology and nutrition factors in metabolic diseases. New methods for implementing scientific research in metabolic diseases will be considered. Day 3 will have a clinical focus. We Are The Pacific Ocean are delighted to support and announce the Tatai Oranga: Joining forces to tackle metabolic diseases 2018 Symposium. We have provided the Marae Protocol to the symposium below. It will combine the expertise of the community, clinicians, and scientists to tackle the epidemic of metabolic diseases type-2 diabetes, kidney and heart disease, and gout, with a particular focus on the impact of these diseases on Māori and Pacific communities. The Symposium will be held over three days from the 4th to 6th April 2018 on the East Coast in conjunction with the Ngāti Porou Hauora Charitable Trust to acknowledge their recent establishment of a joint research centre with the Maurice Wilkins Centre.